On Oct. 4, the U.S EPA published a proposal that that could reduce 2018 and 2019 blending obligations under the Renewable Fuel Standard in the Federal Register, officially opening a 15-day comment period. Comments are due Oct. 19. Badger State Ethanol LLC recently collaborated with Lucas E3 LLC to expand ethanol production to over 90 million gallons at its Monroe facility, more than doubling its original nameplate capacity of 40 million gallons. A bipartisan group of 38 senators have sent a letter to EPA Administrator Scott Pruitt, asking him to ensure the 2018 Renewable Fuel Standard blending requirements promote growth in the U.S. biofuels sector and the U.S. economy. The Renewable Fuels Association, Growth Energy and American Coalition for Ethanol have all submitted public comments to U.S. EPA and National Highway Transportation Safety Administration stressing the benefits of high-octane ethanol fuels. The USDA National Agricultural Statistics Service recently released the October edition of its Grain Crushings and Co-Products Production report, which shows corn use for fuel ethanol was up in July. On Oct. 4, the Senate Committee on Environmental and Public Works held a hearing to consider President Trump’s nominations to fill several government posts, including those at the U.S. EPA. The RFS was among the topics discussed during the hearing. UNICA, the Brazilian sugarcane industry association, recently released data for first half of September, reporting that mills in the south-central region produced more ethanol than sugar for the second two-week period. The U.S. Grains Council is working to develop ethanol markets in east Africa, which are accessible through the Persian Gulf. Brian Healy, USGC’s vice president of ethanol market development, traveled to Kenya recently in support of that effort. On Oct. 9, Gevo Inc. announced two collaborations with the U.S. Department of Energy’s national labs. One collaboration aims develop missile fuel while the other aims to optimize Gevo's ethanol-to-olefins catalyst performance. The Renewable Fuels Association announced the election of officers for the 2018 board of directors at its annual meeting in Des Moines. The RFA re-elected Mick Henderson, general manager at Commonwealth Agri-Energy LLC, as chairman. Researchers at Michigan State University will use a $1.1 million U.S. Department of Energy grant to fight disease in switchgrass by identifying regions of the genome that cause disease resistance. The Donald Danforth Plant Science Center recently announced a 5-year $16 million grant from the U.S. Department of Energy. The research aims to accelerate development of elite energy sorghum varieties for production under marginal environments. 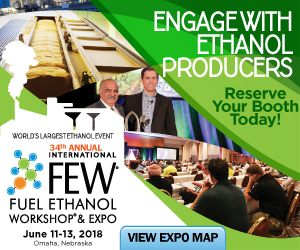 Growth Energy announced that more than 1,000 fuel stations around the country are offering E15—a fuel with 15 percent ethanol—more than doubling the number of stations from the same time last year. Scientists at Ames Laboratory are experimenting with chemical reactions that decompose lignin models at low temperatures and pressures. The team is combining the decomposition and stabilization processes into one multi-functional catalyst. The American Coalition for Ethanol is helping fuel marketers and retailers urge the U.S. EPA to use the midterm evaluation of the 2022-2025 model year vehicle emissions and efficiency standards to level the playing field for flex fuel vehicles. The Global Renewable Fuels Alliance has reacted to the International Energy Agency’s latest medium-term outlook on renewable energy by noting that once again projections are anticipating continued increased growth in demand for conventional biofuels. Competitive landscape, innovative technologies and emerging energy policy were hot topics as a diverse group of nearly 150 thought leaders, industry representatives, researchers and suppliers convened at the Energy Conference in Iowa Sept. 11-13.